I’ve been a bad author. It has taken me far far too much time to get Delphinium done, and frankly, I’m still not finished. I get ahead of myself and make plans, and then I realize I can’t do what I want to. With a blog and facebook and twitter I’ve found myself also spouting all my plans to people who actually count on me. Then I can’t deliver. Then I’ll send it over to my editor to catch any last moment issues I may have missed, and release it on Amazon/B&N/Kobo. Sadly at that point the ‘first edition’ will be taken down. The first part of Delphinium will be up *tonight. * It’s late-ish (East Coast) but I’ll have it up before I crash for the night. I promise. KDP Select is ending for Larkspur: A Necromancer’s Romance and to celebrate I’m using up my last two free days! Originally I wanted Delphinium out on the 20th as well, but that hasn’t worked out quite as well (it will be out on the 30th though!) Sunday Larkspur will be put up on Nook, Kobo, and probably Apple as well. A dark fantasy romance, Delphinium continues the story of the duc de Piques, Pierre Salvador, and his newly found love the Lady Elizabeth Anne. They go spend spring at the duchy that Pierre is in the process of inheriting, and find not everything is at ease. The advisors are wary of a new lord, and a sickness plagues the outer lands. But the lord himself is too occupied with his other passions to pay much attention- he has a new student, and an old love. Rumours of necrocræft begin to surface, the use of a magic over life and death- a magic that Pierre has just mastered. It is for Zoe Dawson’s ‘The Starbuck Chronicles: AfterLife’ – it’s urban fantasy. I’ll have a 15 minute slot from 5:45pm – 6:00pm, where I’ll be there to answer questions or receive comments. 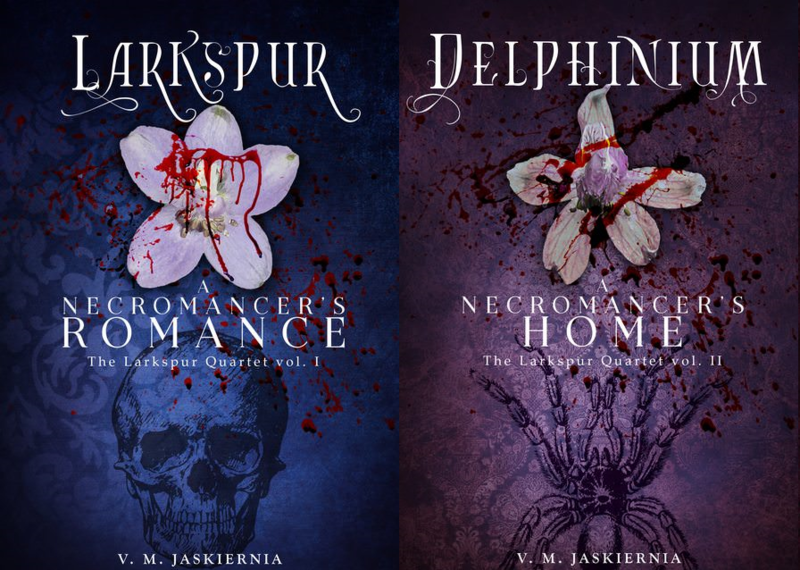 I’ll also be asking everyone the meaning of purple larkspur– and the chosen winner will get a copy of Larkspur: A Necromancer’s Romance emailed to them.